A warm, wonderful centerpiece for your hearth and home. A warm, wonderful centerpiece for your hearth and home. This furniture quality cast iron stove is the largest non-catalytic cast iron woodstove in the world. Durably built and superbly crafted, the Jøtul F 600 Firelight CB offers both front and side loading convenience in a classic design inspired by colonial American furniture. Popular options include: fire screen for open door fire viewing, leg bracket kit, outside air adapter, bottom and rear heatshield, and a choice of three enamel colors. 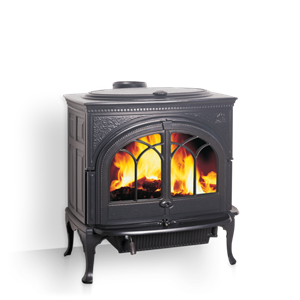 At only 2.6 grams of emissions per hour, The Liberty is the cleanest burning large stove ever approved by the EPA. One of Jøtul’s most popular and most imitated woodstove is back! This is our signature small / medium woodstove now with an enhanced fire view.